Whether it is floods, droughts, or just a normal year, lake level fluctuations (or the lack of them) are important to document. Lake levels are recorded on a regular basis, thanks to the efforts of volunteer observers. These volunteers are joining with the Minnesota Department of natural Resources to create permanent, credible, public lake level records. Lakeshore development and use are often adversely affected by water level fluctuations, such as flooding damage. Knowing and understand the history of water level fluctuations can help shoreland owners cope with the natural fluctuations of a lake. The water levels of all lakes fluctuate, some more than others. Although water level fluctuations in Minnesota are typically one or two feet in any year, historic fluctuations in excess of 10 vertical feet have been recorded. Fluctuations an be the result of human activities, such as construction or operation of a dam, or acts of nature such as beaver activity. However, water level fluctuations are primarily a response to changes in precipitation (rain or snow). 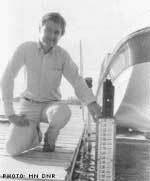 Historic water level data are useful in developing computer simulations of lake fluctuations. The data are used to estimate flood levels, which in turn are used by local zoning officials to locate building or sewage treatment sites and to establish low floor elevations for new construction. The data are also used for administration of DNR's public waters permit program and to help determine ordinary and historic high water elevations. Watershed managers and planners use historic lake level data to prepare local water management plans and to model lake water quality characteristics. Lakeshore owners use the data to better understand the impacts of water levels at their property. Call DNR Waters to determine the status and eligibility of your lake for the Lake Level program: 651-259-5700. DNR Waters will install either a permanent lake level gauge on a structure (bridge pier or dam abutment) or a temporary gauge. A temporary gauge is fastened to a steel fence post and driven into the lakebed next to a location convenient for the reader. Temporary gauges are checked or reset each spring. The elevation of each gauge is determined annually so water levels can be compared from year to year. A lake gauge should be read once a week, at approximately the same time each week, and within 12-24 hours of a rainfall greater than two inches. Gauge readings taken after a rainfall event help show the interaction of the lake and its' watershed. Ready-to-mail postcards for recording gauge readings are issued by mail or in the spring during temporary gauge installation. It is a good idea to also record the readings on a calendar for back-up purposes. Observers are asked to submit these cards every 6-8 weeks, and note if additional cards are needed. Water level readings are stored in the DNR's Lakes Database where they can be analyzed and retrieved easily. Observers receive an annual report with a summary and graph of the water levels for their lake. Other reports can also be prepared upon request.